Dance is one of Ros Glendinning’s passions, and she shares it through her interactive dance fitness programme, CheeziFit. But as more people with a variety of conditions started to attend the sessions, she decided she needed to tailor the moves to make them clinically relevant. Ros has found that people who enjoyed the classes kept coming back, therefore helping them to achieve a regular level of physical activity which is also key to good health. Now, thanks to undertaking BSc (Hons) Physiotherapy at the University of Plymouth, she is putting her research into her choreography and enjoying ‘changing lives’. Ros (far right) with Michael Chequer at the BBC Radio Devon studios. What has Ros added to her choreography thanks to her physiotherapy degree? 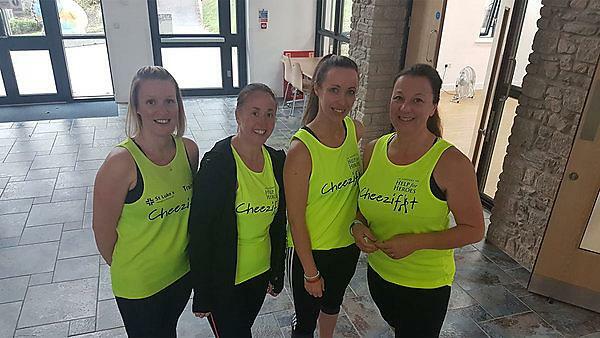 Ros is now in discussions with local NHS physiotherapists to talk about introducing CheeziFit to the NHS, through chair-based dance exercises for patients. “CheeziFit has such a welcoming, community feel and is so simple, and that it’s now of clinical relevance is taken seriously. I’m training other instructors and physios to deliver it within their own communities but they must have an in-depth understanding of the reasons behind the choreography, it’s a very thorough process. Physiotherapy is one of 14 Allied Health Professions (AHPs) celebrated as part of the inaugural national AHPs day on Monday 15 October #AHPsDay. The aim of the day is to celebrate the work of AHPs and encourage people to consider it as a career. Learn to work in diverse practice settings, including neurological, sports and respiratory, in a variety of healthcare locations including hospitals, specialist rehabilitation centres as well as patients’ homes.